Saying ‘thank you’ is a great way to show your appreciation for someone’s kindness or help when you need it. A sincere ‘thank you’ is always valued and when it is accompanied by a thank you gift card, your gratitude becomes more than words! Buy a thank you gift card from GiftCardStore to show your thanks for a job well done or for extra effort on a special project. 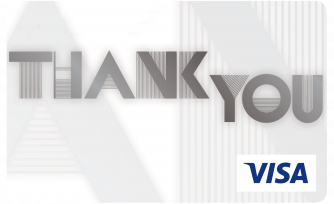 Perfect as business rewards for staff at recognition functions, you can say thanks with a prepaid Mastercard or Visa gift card. Global payment brands Mastercard and Visa are accepted worldwide for online shopping and at millions of merchants. Whoever you are thanking will appreciate that the thank you gift you have chosen means they have the freedom to buy what they want, when they want. Select the card that best expresses your thoughts with the design to fit the occasion. 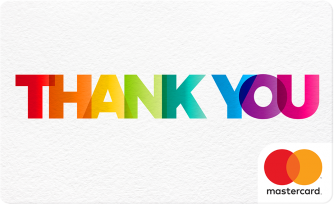 You can choose the sentiment and design with ‘thanks’, ‘thank you’ and ‘I just want to say thank you for everything’ as well as ‘thank you so much for all your help’ being the most popular cards. If you prefer to individualise your thank you card you can design your own gift card. At GiftCardStore you can use your own photo to personalise your appreciation and add a special message for the recipient.